Something that often strikes me when listening in on conversations (or participating in them) with people working in the same circles as I do; people who have been part of the social scene of Dubai for quite some time, is that our little “ding-ding” world isn’t always being appreciated. It’s almost like all the experiences we get treated to are oversaturated. I sense that I’m a bit nerdy and old-fashioned for generally getting excited by the prospect of something fun happening! But you guys know me! I’m happy go lucky. Always thankful and curious when I get an invitation to participate. Seven years in Dubai and I still never get tired of this weird and luxurious spot! I still feel genuinely blessed for everything I get to experience that are far from a regular 9-to-5 job. 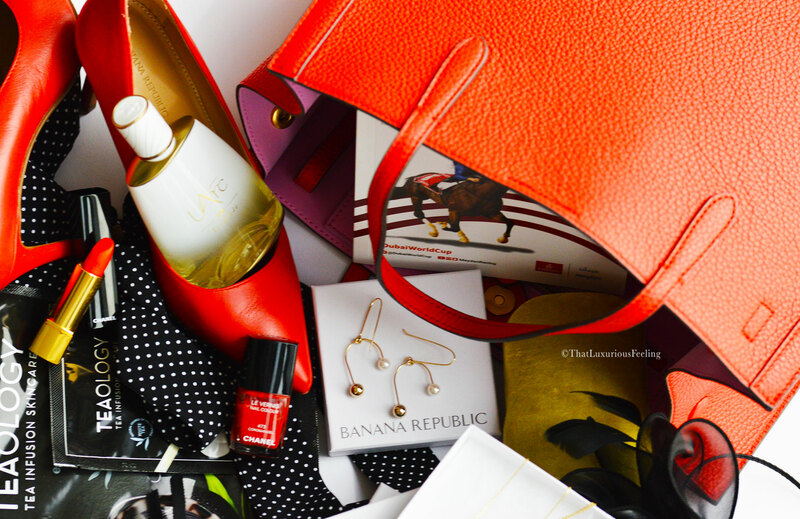 Naturally, when Banana Republic ME contacted me with an invitation to the 2019 Dubai World Cup Horse races with an offer to dress me for the occasion, I literally jumped up and down! I might even have canceled a pool-day with my bestie, that’s how bad I am. Anyway, this will be short and sweet. I thought I’d tell you what I wore on the day and give you a little bit of a sneak peak into the glitz and glamour of the world’s largest Horse Race competition. First up: the lovely outfiit. I am a skirt or dress girl through and through. I own about five pair of trousers or jeans as I truly feel uncomfortable in them. While in the fitting room at Banana Republic I took my time and tried out 7 different dresses – all suitable for a day at Meydan Race Course. Imagine my complete surprise when the choice landed on a jumpsuit! PANTS! Dark black with tiny white polka dots and a cute bow at the waist. I should have felt out of my comfort zone but the quality of Banana Republic’s fabrics makes them move and fall so beautifully with your body. The jumpsuit managed to hide all of my insecurities while emphasising a toned but curvy figure. I felt like myself – but with a modern 2019 touch. Because the jumpsuit itself were quite simple, we decided to color block and use lots of nice accessories to lift the outfit. The 2019 Dubai World Cup arrived with a prize purse of a whooping US$35m the 24th edition of the races attracts all of the most prominent teams of the world. AS Dubai hosts the eevent on our state-of-the-art race Meydan Race Course, our National Team Godolphin always reaching top positions. Every year, as part of the social scene surrounding the races, influencers and other well known faces participate in Style Stakes; a catwalk showcase of the best dressed men and women where multiple brands are represented. 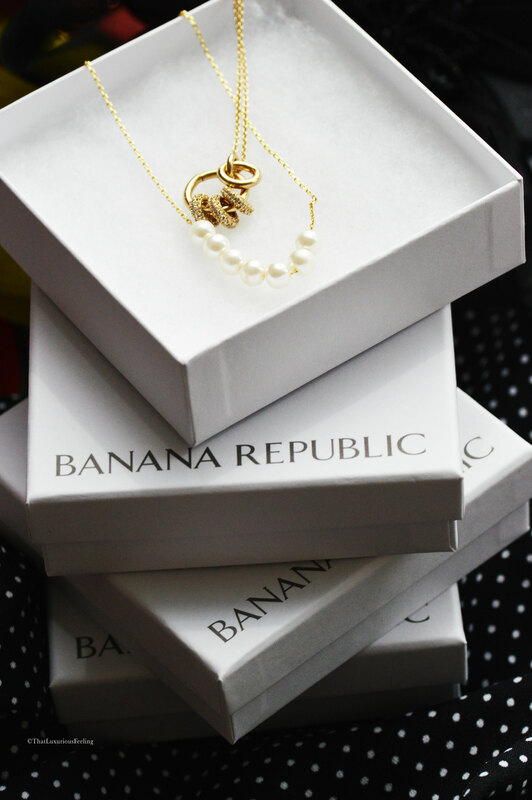 I felt excited and blessed to be a part of this together with Banana Republic! All participants could register for the fun competition and the judges always put on a show to find the Best Dressed Lady/Man/Couple and the most creative hat. Although I never entered the competition, I felt like a little modern princess in my jumpsuit and coiffe. The tote bag was an instant hit. Normally I prefer smaller clutch bag for events; but the fact that I could bring a cardigan and other important items such as sunglasses, extra battery to my iPhone (a necessity when working with social media. If you know, you know!). The fact that the bag also is bright pink on the inside makes it so chic. I’ve got a lot of items from Banana Republic in my wardrobe. One of the things that many seem to miss out on when entering the store is the huge collection of beautiful and tasteful accessories. The price point is decent but not cheap which mirrors the quality and design well. For the Races I wanted something simple, elegant and still pieces that would be easy to wear to work. I like it best when items can be dressed up or down depending on the event. By combining two necklaces on thing gold chains; one with a string of white pearls and the other one with interlocking charms, the simple v-neck of the jumpsuit got a bit more umpf. 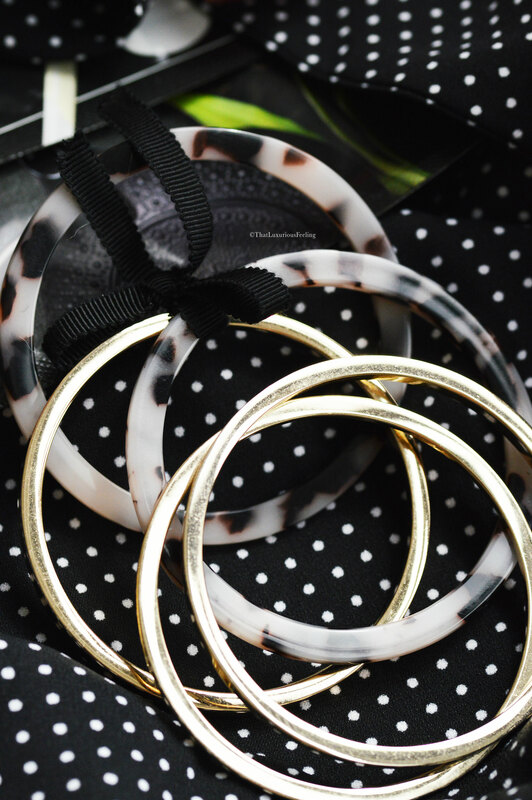 When you find gold and “marble” bangles that come in a set of 3…you make sure to grab two sets and parade around swinging 6 bangles to highlight the drink. With simple gold and pearl earrings it needed a bit of extra-all for the wrists. 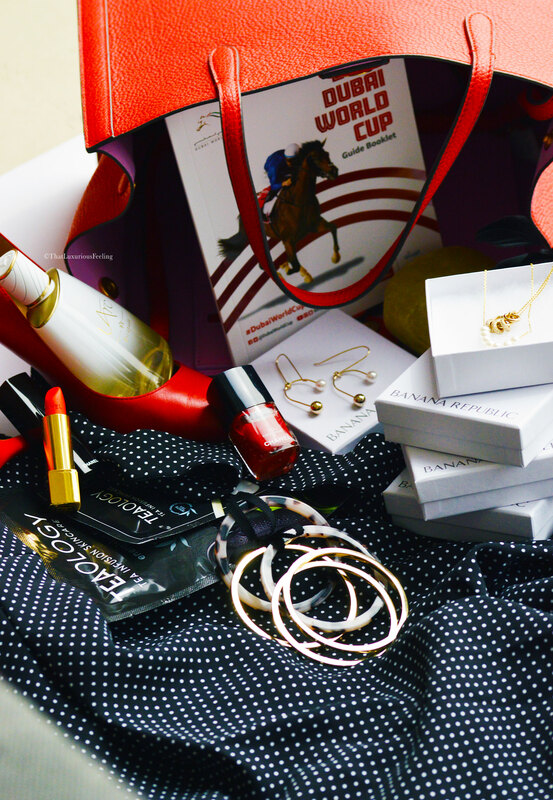 Last but not least: yes, That Luxurious Feeling is all about high-end beauty and my outfit for the 2019 Dubai World Cup wouldn’t have been complete without a bit of CHANEL and of course spritzes of a carefully selected niche perfume. I decided to match the shoes and bag with my nails and lips. Maybe not all that original but I love a bright lipstick and always find a way to wear it! 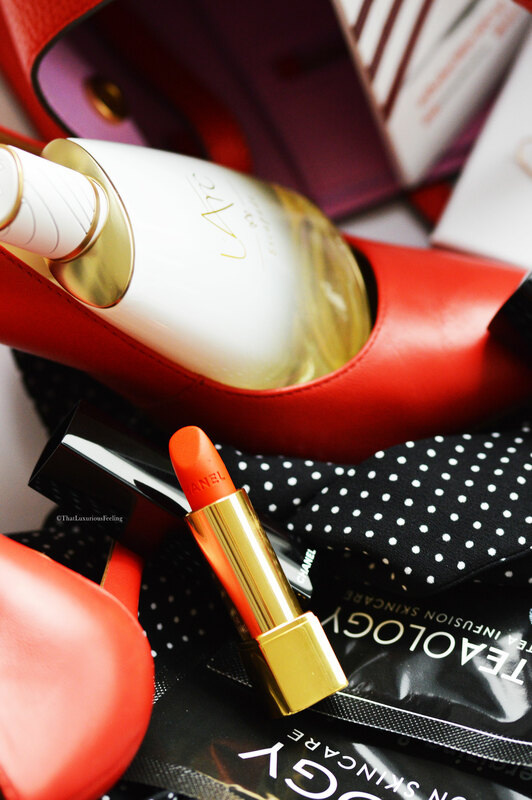 For this day I opted for CHANEL Rouge Allure Velvet 64 First Light – a semi matte bright tomato red shade with a velvet texture. It wears beautifully and lasts well even when you drink and eat. For my nails I wore CHANEL Les Vernis 473 Coromandel. 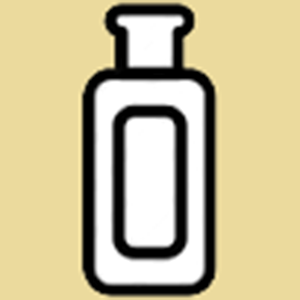 For those of you interested in niche perfume I need to finish off this article by showing you my new L’Arc Perfumes bottle, the second in my collection. Called Escapade its absolutely perfect for an elegant day-event with its white notes and fresh peaches. I’ll make sure to review it more closely in another article. Essie, You always pick me up!